In search engine optimization, the measurement of certain metrics is critical to success. These include data about rankings, referrals, links and more. Analytics software gives marketers powerful insights into their search, social, brand, and content marketing. The challenge is that this wealth of information comes at a price. Sometimes, because there is so much information, numbers and reports that you need to sift through, marketers get overwhelmed in trying to see the light of day through it all. But data overload should hardly be the reason stopping you from using analytics to improve your marketing effectiveness! Remember that successful marketers and SEOs alike don’t make decisions based on feelings. You shouldn’t either. Your decisions should be based on data and cold hard facts. And where do you get that data come from? – Your marketing analytics, of course! Successful marketers have a trick up their sleeve that not many of us know about. They tie every single lead, customer and dollar back to the marketing initiative that led to them in the first place. This is called closed-loop marketing. Closed-loop marketing, in essence, cuts through the widespread vagueness of marketing as we know it and reveals real information and numbers and data about the success or failure of any marketing effort, lending insight into your entire customer life cycle. The significance of closed-loop marketing is that many actionable improvements will rely on data from these analytics. With closed-loop marketing data, you can track a lead from the moment they first interact with you until that lead becomes your customer. Powered with the acquisition of this information, you can then revisit your marketing channels including your business blog and social media accounts to make them more effective in generating customers at the lowest cost. Are you looking for a way to easily measure and track those metrics that matter to your business? Where marketing is concerned, creating road maps for success is easier when everything is in one place. Moz offers four Moz Pro subscription plans priced at $99/month (for the Standard plan), $149/month (for the Medium plan), $249/month (for the Large option) and $599/month for the Premium package. The other two subscription plans fall on a gradation between these two extremes. At a glance, the Moz Analytics Dashboard gives you a quick insight into your performance on the inbound marketing front. With a single view, you can find patterns in your traffic, track where it’s coming from and see how quickly it’s growing. The measured metrics include: Traffic, Attention, Authority and Data Snapshot. In marketing, it’s important to know whether or not your audience is finding you. With Moz Analytics Search, you can view your total traffic from organic search, find out which search engines and keywords are bringing in the most traffic and discover new keywords to target. The measured metrics include: Organic Search Volume, Keyword Rankings, Keyword Opportunities, On-Page Optimization and Crawl Diagnostics. What’s the point of engaging with fans and followers on social media if your efforts are not paying off? With Moz Analytics Social, you can analyze the total size and weekly growth of your social presence. You can also scope out the competition. This allows you to analyze what your competitors are doing and to assess their reach. The measured metrics include: Total Network Size, Traffic & Links from Social Channels, Twitter, Facebook, Most Engaging Posts & Tweets. In any marketing campaign, link analysis is an important part of the process. With Moz Analytics Links, you can now view which links in your link profile are driving the most traffic. You can also find out where on the web you’re mentioned without a link. The measured metrics include: Competition, Established Links and Opportunities. With Moz Analytics Mentions, you can find out whenever someone mentions your brand. Monitoring where on the web your brand is being talked about can provide you with the unique window of opportunity to take advantage of new opportunities, marketing prospects and ways to connect. The measured metrics include: Brand Mentions, Traffic from Brand, Competitor Mentions and Industry Mentions. You can also customize your mention tracking to your heart’s desire with Manage Queries. And finally, with the Moz Pro Research Tools, you can perform in-depth research on your site and your competitors’. 1. Keyword Tools: Helps you track rankings and analyze keywords. You can also, using the same tool, check any page to see if it is optimized for a specific keyword you think will bring in traffic. 2. Link Analysis: Using Open Site Explorer, you can view any site’s links, top pages, link metrics, and social data. 3. Web Mentions: Use this tool to track mentions of anything you want. 4. Social Analytics: Using Followerwonk, dig deep into your Twitter analytics and match your activities to gains and losses. 5. SEO Toolbar: The MozBar for Chrome and Firefox can be used to research any site on the web. As compared to Moz, Raven only has two different subscription plans priced at $99/month for Raven Pro and $249/month for Raven Agency. Raven Pro is directed towards marketing consultants and small businesses. Raven Agency, on the other hand, is more appropriate for midsize to large teams/businesses. Any new marketing and SEO campaign needs a baseline and a road map to success. For example, what’s the pulse of your website like? Does it have any technical issues? How are your competitors performing as compared to you? With tools like Site Auditor and Site Performance, you can answer these questions. In addition, using Raven’s Keyword Ranking tool, at a single glance you can analyze your ranking data that comes directly from Google and Bing Webmaster tools. Research Central and Link Manager, on the other hand, provide all the information you need about the quality of your site and the links pointing to it. Raven makes managing social media easy. See, social media marketing is a challenge to most marketers. There are so many networks and each network differs significantly from the immediate next. Marketing on Facebook is nothing like marketing on Twitter. The audience is different, the community is different and the best practices are different. You can also not be everywhere at the same time. With Raven’s Social Stream, you can view, in real-time, all the social media conversations you can join. Alternatively, if you’re in a research or stalker mode, dig into your Twitter, Facebook or LinkedIn account or that of your most successful competitor to stay on top of the social media game. Faster research results in better content. With Raven’s Content Manager and CRM tools, managing your content and contacts becomes easier. If you’re running low on ideas, Research Central is a good place to get inspired or you can alternatively access the Order content for SEO tool to order original content suitable for SEO from Textbroker. Raven makes it easier for users to identify PPC keyword opportunities. The tool for this is once again Research Central, which gathers data from multiple keyword research resources including but not limited to AdWords data. Raven also has an AdWords Insights tool that allows for users to identify quality issues. These could be costing you money! Marketers always have to draw up comprehensive marketing reports. With Raven’s Report Wizard tool, this part of your job description will cease to be as daunting as before. Users can create a report with any combination of SEO, social and Google Analytics data in a matter of minutes. You can also brand your marketing reports for a personalized, custom feel. With Mondovo, you can get instant access to critical business information to maximize revenues. 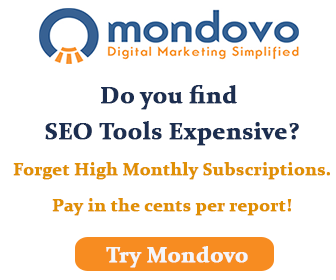 Mondovo is priced at $49-$99/month. – Variable number of social accounts based on your subscription. Mondovo has the capability to do a wide range of things. This single tool can be used to manage all aspects of your website’s SEO. From keyword research to a site-wide audit, it covers all bases. You can also keep track of the status of your old backlinks: if they are still live or if they have been taken down. This way you can decide if you should create more backlinks to compensate, or try to get the lost links back by contacting the webmasters. This platform provides an easy way to manage your Facebook and Twitter accounts, right from its own dashboard. You can monitor pretty much everything. It also comes with its Facebook Competitor Analyzer and Twitter Competitor Analyzer; 2 modules that allow you to spy on your competitors’ social marketing strategy! Analyze what, when and how they are posting things and engaging with their followers – all in one place. Google Analytics is the engine Mondovo uses to collect valuable data from your visitors; identify your best traffic sources, see what your visitors are spending the most of their time on, and more. Tracking metrics is like a game with Mondovo’s dashboard. Unlike other software where everything is where their designer thought it would best fit, Mondovo allows you to move your data around, in a way that pleases you. This way, you can put all your favorite metrics on top, and get the rest of the metrics that don’t interest you out of the way. This is especially useful for those of us who are not only big on data, but also big on visuals. We are very happy to bring you a fresh and new look for Directory Critic – your ultimate resource for directory lists. Our design and development teams have been working on this new design for a few months and we are very proud of the team behind this chic, pleasant new look. When we started with this task, our idea was to make the site look clutter free and make it easier for users to access what they want with minimal clicks. The homepage has been redesigned with this objective in mind. Now we have made your sought after lists, be it the list of free directories, list of niche directories or paid directory list, accessible with much more ease. The advertising space also has been redefined to give more eyeballs to the banners of our advertisers, without whose support we would not be able to maintain this site. Displaying a vast list of resources like ours is a challenge for any designer, and we hope we have made the list pages more user friendly with the new design. We haven’t made any changes to the directory related information such as Page Rank, directory type, category, rating etc. so you continue to get all those valuable bits information about each directory as it used to be. Same goes with the functionality like sort the lists – based on Page Rank, ratings, date of submission etc. ; we’ve retained all that functionality. Our most recent service additions, where we allow you to order from our various directory submission services, have also undergone a design change to make your directory submission ordering process quick and easy. SEO in general and link building in particular have evolved a lot over the last few years, but the effectiveness of quality backlinks hasn’t changed much. There are numerous examples of the usefulness of getting listed in directories even now, yes even after the algorithmic updates like Penguin. But you need to know how to identify good directories and submit your sites to them. As always, Directory Critic will continue to be a helpful resource for webmasters across the world. Submitting your site to directories with the objective of getting listed in them has two benefits. First, if the directories are good, you can attract targeted traffic to your site. Though the traffic volume is less, the relevance and conversion is likely to be high. Second, each listing is a backlink which is important from Search Engine optimization point of view. The more links your site has, the better your chances are for ranking better. 1. Make sure the directories are indexed and cached by major search engines like Google, Bing etc. If the directory itself is not indexed, there is no point in getting listed in it. 2. Don’t submit to large network of directories hosted on one or few ip addresses. 3. Vary your anchor text by writing as many titles and description as possible. 4. Target various terms – main keywords, your brand name, exact match domain name, synonyms of main keywords, related keywords, long tail keywords etc in the titles and descriptions. 5. Never use automated submission tools which makes 1000 submissions in one minute. Submit to each directory manually or use the services of a manual directory submission service provider. 6. Submit to directories over a long period of time by spreading it across several months. 7. Make sure the directory is actively managed. Check the quality of other sites listed in it. 8. Submit to various types of directories – general, niche, regional, country specific, industry specific, premium directories etc. 9. Some directories allow linking to home page as well as inner page, make use of that. 10. Last, don’t depend entirely on directory submissions. Use other link building tactics like guest blogging, infographics, social bookmarking etc. along with directory submission.